George the Atheist has the scoop. But Mr. Salamanca’s bill has the support of the City Council speaker, Corey Johnson — an important sign that the legislation will be seriously considered by the 51-member body. “I don’t want to send a message that the only folks who can get affordable housing are folks who end up in shelter. 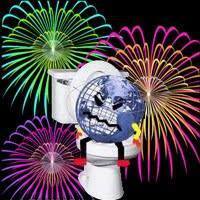 I think that’s wrong for everyone,” Mr. de Blasio said. Increasing the minimum amount of housing for the homeless would also make it more difficult to finance affordable housing projects. In order to make affordable buildings financially sustainable, there has to be the right mix of people from all incomes, city officials said. 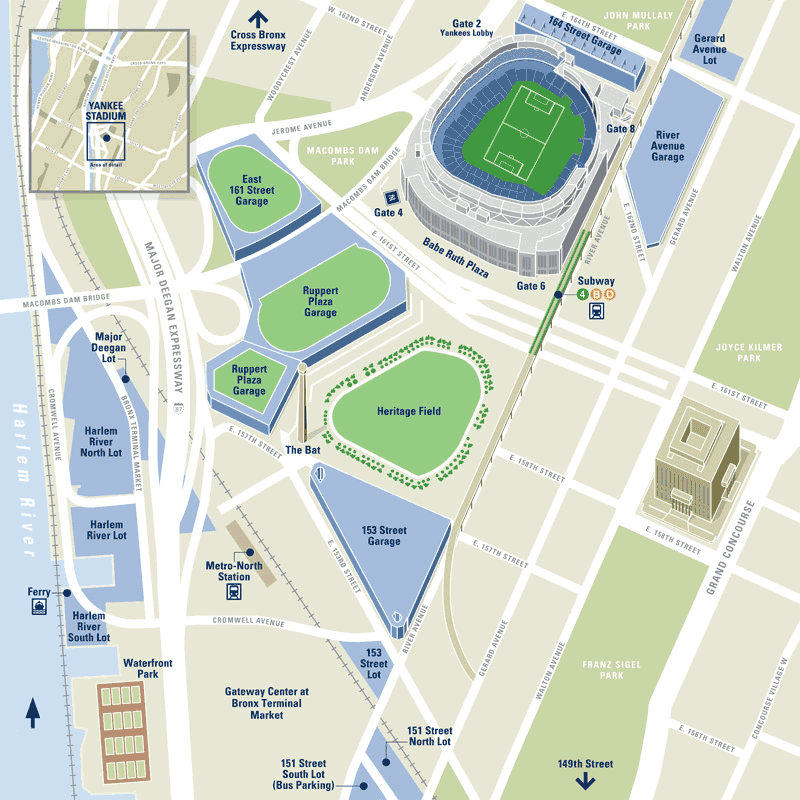 The Yankees insisted they needed thousands of additional parking spots for fans when the new stadium was built, so about 9,100 spaces were created or preserved in 2010. 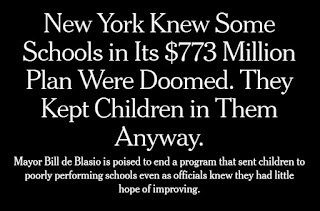 Mayor Bill de Blasio promised to “shake the foundations of New York City education” in 2014 with a new program called Renewal, a signature effort to improve the city’s 94 poorest-performing schools by showering them with millions of dollars in social services and teacher training. A year later, aides raised a confidential alarm: About a third of those schools were likely to fail. 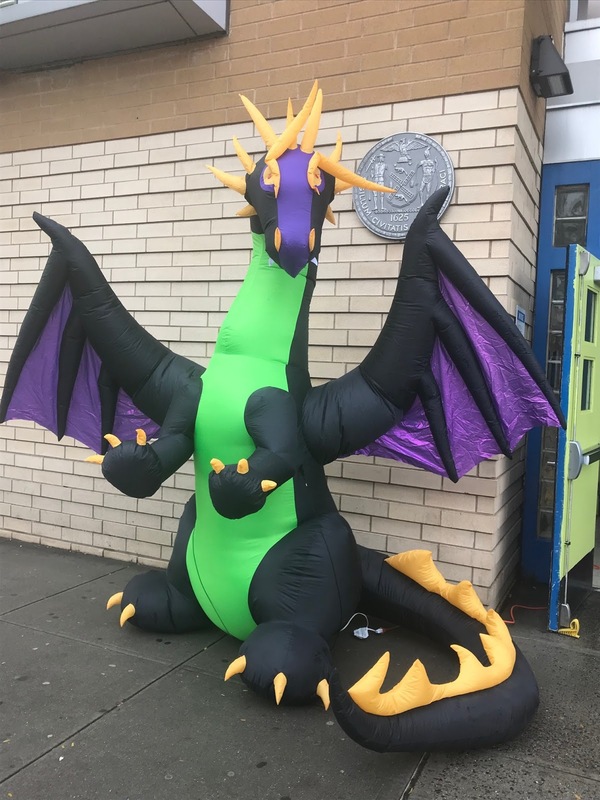 The schools were not meeting goals that the city set for higher test scores, increased graduation rates and other academic measures — and probably never would, staff members in the Department of Education warned in an internal memo prepared for the mayor. Mr. de Blasio kept most of the schools open. Now, after sending thousands of children into classrooms that staff members suspected were doomed from the start, the administration appears ready to give up on Renewal. Its cost: $773 million by the end of this school year. Nuni, who had begun to strip in her home state of Colorado while obtaining her bachelor’s degree, said she prefers “white strip clubs” over “black strip clubs” because of what happens behind closed doors. According to Nuni, the clubs are labeled “black” or “white” based on the clientele. Manhattan strip clubs generally have a mostly white and wealthy clientele. She said the strippers at those clubs are 65 percent white, 10 to 20 percent black, 20 to 30 percent Latina and less than 10 percent Asian. Queens is generally home to clubs that mostly feature black and dark-skinned Latina strippers with synthetic bodies, dancing for a mostly black and Latino clientele, usually with rappers and special guests in attendance. Nuni said a big difference between the two types of clubs is the dancing. “White strip cubs are mostly talking and black clubs are mostly twerking,” said Nuni. Nuni, who was used to dancing in what she called “a liberal college town,” said she experienced a huge culture shock when she moved to New York and danced for the very first time at Angels. In addition to the uncomfortable change of attire, Nuni said she was charged the $60 house fee at the start of the night. 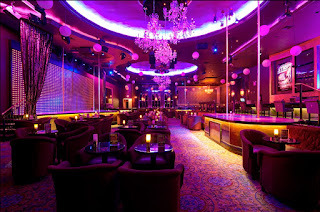 The house fee is a set number that dancers are expected to pay the club in order to dance there. Nuni, who was used to walking up to men and engaging in conversation, said at Angels the strippers walked up to men who had stacks of one-dollar bills and just began dancing on them. Community Board 3 last Thursday overwhelmingly voted in support of a variance that would allow for a two-story home to be built at 31-41 97th St. The lot, not far from the Louis Armstrong Middle School, has been vacant since the city tore down a home at the location in 1976. “We feel that this resolves a hardship in a unique situation, fills a lot that has been vacant for 40 years and fits with the character of the neighborhood,” said architect Arthur Yellin, who is working with the owner, Luisa Beneby, to develop the property. Yellin said the situation is a result of the city’s decision years ago to subdivide the lot after it condemned and demolished the dilapidated structure that previously existed there. Officials sold the parcels separately and Beneby bought one of the lots in 1978. 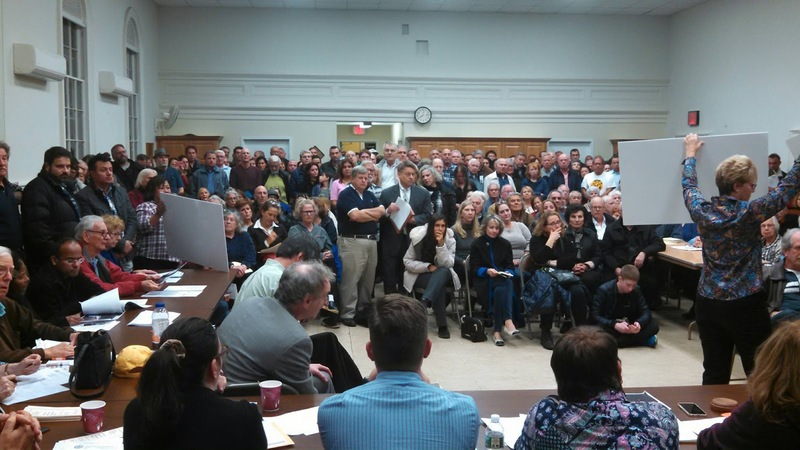 Developing the 20-foot-wide lot has proven to be a challenge, according to Yellin. A variance is needed because the property doesn’t have enough space to include a side yard. It is also not feasible to have a driveway or garage with two parking spaces side-by-side. “It cannot be developed in any way without a variance,” Yellin said. Beneby has filed plans with the Buildings Department to construct a two-story, twofamily home. It would include a garage underneath the building with vehicles parked in tandem, one in front of the other. The sides of the home would be on the lot lines. One of the conditions for the variance is that the hardship for which relief is being sought wasn’t created by the owner. The proposed home is also required to fit within the context of the neighborhood. Yellin said both requirements were satisfied. A Queens consumer now produces more energy than he uses thanks to his new solar panels. But he still has a problem. Lynda Baquero reports. The city is preparing to begin accepting applications next year from lower income homeowners looking for loans to finance property repairs. The city's Department of Housing Preservation and Development and the nonprofit Enterprise Community Partners are expected to announce Wednesday that they are seeking a third partner to administer the forthcoming HomeFix program. The final collaborator — which will also be a nonprofit — will be offering technical and financial assistance to homeowners, helping them with loan paperwork, processing the applications and identifying general contractors to perform the repairs, according to HPD. 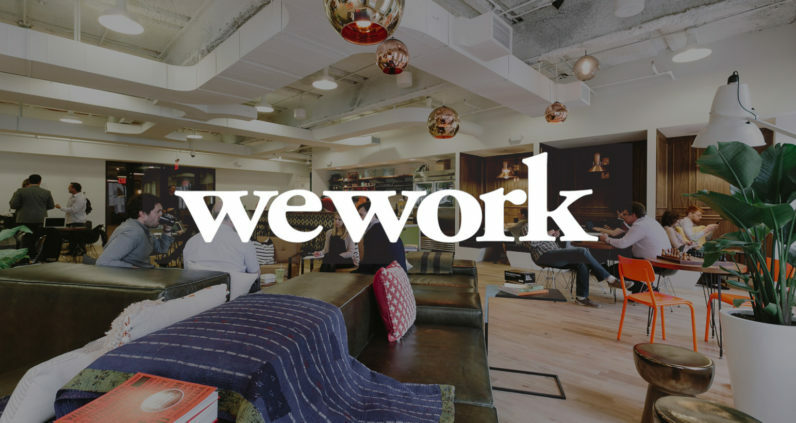 HomeFix, which was announced last November, is designed to help owners of one- to four-family homes, who may struggle to acquire financing from the private market. Under the program, HPD will issue and service loans to about 150 New Yorkers annually, who earn no more than 165 percent of the metro area's median income. 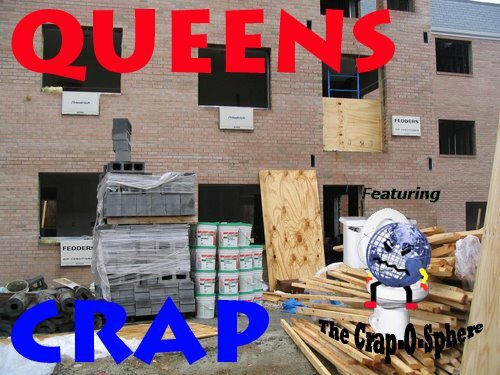 What's causing Queens Village pipes to fail? Gremlins with teeny-tiny drills are burrowing their way underneath Winchester Boulevard in Queens Village and creating pinholes in copper pipes leading from water mains to the houses between Braddock and Hillside avenues. It’s as good an answer as the ones homeowners on Winchester are getting for why connector pipes are failing at an alarming rate; so often — on multiple occasions for individual homes in some cases — the company that used to insure the pipes has stopped doing so along that part of the street. Tom Garrett, who has owned his home for 40 years, said pipes began failing in about spring 2015. By the time his pipe had to be replaced for the first time, people were becoming suspicious. He now estimates that more than 20 replacements have had to take place, including one neighbor who has required it six or seven times. “Plumbers who’ve been doing the replacements say it’s being caused by electrolysis. Electricity leaking from somewhere causing pinhole leaks in the pipes,” he said. A partnership between the Chetrit Group and Queens developer Mount Sinai Properties pre-filed permits to build a 122-unit apartment complex at the former site of the Queens Motor Inn. 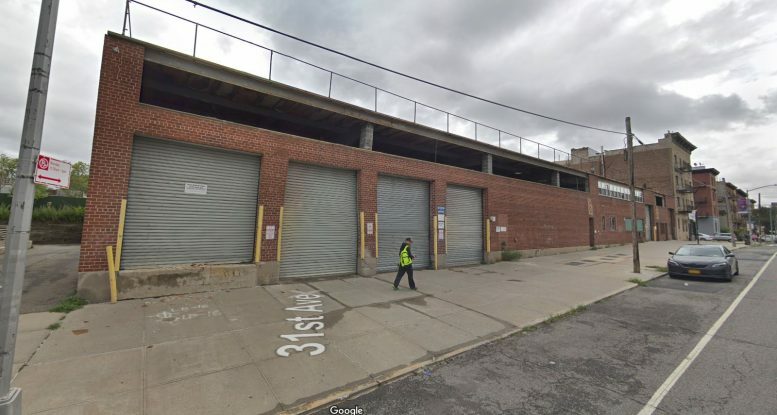 The partners are looking to build an 11-story residential building at 43-21 64th Street in Woodside, just a few blocks the Brooklyn-Queens Expressway. The planned structure would contain 122 apartments, according to documents filed with the Department of Buildings. Plans call for a nearly 99,000-square-foot property with about 95,000 square feet for residential space and 3,400 square feet of commercial space. Amenities at the property include recreation rooms on the eighth floor and a rooftop space, according to the plans. The ground floor commercial space is earmarked for a car showroom. Chetrit and Mount Sinai acquired the property, which used to have the address of 64-11 Queens Boulevard, for $13.4 million in August of last year. Demolition permits were filed for the two-story building on the site in August of 2016. The property used to house the Queens Motor Inn, a motel that rented rooms by the hour. 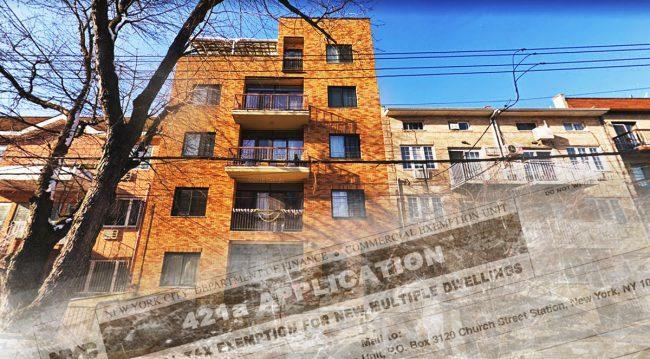 A pair of Queens landlords spent years cheating the state out of almost $500,000 in property taxes by manipulating the 421a program, according to a lawsuit from the New York State Attorney General’s Office. The lawsuit seeks to ban Queens landlords Ram Cohen, Eldad Cohen and their company ERC Holding, LLC from participating in New York’s real estate industry. It also aims to force them to repay the property taxes they dodged, along with the profits they made from selling their building at 71-44 160th Street in Fresh Meadows. 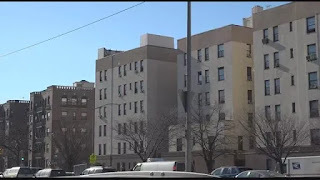 The brothers finished building the 10-unit building in 2009 and applied for a tax exemption with the city under the 421a law, according to New York State Attorney General Barbara Underwood. The exemption requires the Cohens to abide by rent stabilization laws, but the suit alleges that they stuck tenants with unregulated leases instead. The attorney general’s office previously ordered the Cohens to start treating their tenants as rent-stabilized in 2014, but they did not do so, the lawsuit says. The Cohens also tried to make their building appear more valuable than it actually was by listing inflated rents on all of their leases and giving tenants separate riders where they would agree to pay lower rents, the suit says. They kept these riders secret from banks, regulatory agencies and a prospective buyer to make the building appear more valuable than it really was and sold it in 2016 for $3.75 million, according to Underwood. Former State Senate Republican powerbroker Dean Skelos and his son Adam both unexpectedly won reduced sentences in Manhattan federal court Wednesday for their corruption convictions in a retrial of charges the senator shook down companies to get $300,000 in jobs and fees for Adam. U.S. District Judge Kimba Wood, who sentenced the father and son to prison terms of 5 and 6-1/2 years in 2016 for their later-reversed convictions on the same extortion conspiracy charges, cut Dean Skelos’ sentence to 4 years 3 months and Adam’s to 4 years in the wake of their July retrial. Despite the reductions, the judge said she wanted the sentences of the two Long Island men to send a message that would reverberate in Albany, where ethical missteps and indictments have become a routine occurrence in recent years. 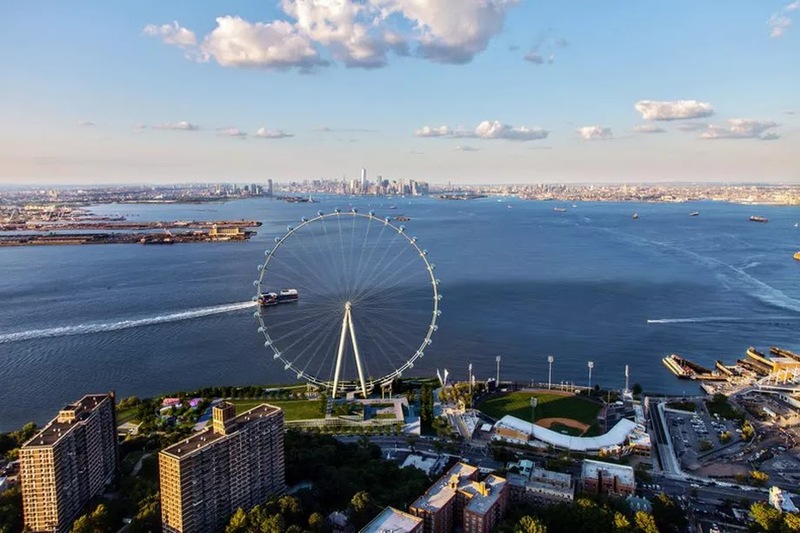 Developers behind Staten Island’s ambitious New York Wheel have officially pulled the plug on the project, ending months of speculation about its future. Staten Island Advance broke the news of the development, which is a startling turn of events for a project that was once touted to usher a renaissance for the North Shore section of Staten Island. For over a year now, the observation wheel project has been beset by infighting, construction woes, and more recently, legal troubles. 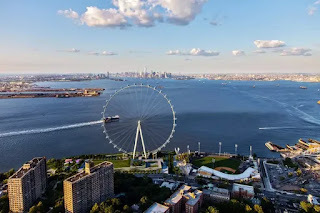 The developer, New York Wheel LLC, was battling its former contractor Mammoet-Starneth on ownership of some of the Wheel’s parts, and last month a court granted the developers an extension to hire a new contractor and show that it had enough funds to procure those parts. However, two of the lead investors in the development—Lloyd Goldman and Jeffrey Feil—later expressed skepticism about the project moving forward without significant city funding. Both mayor de Blasio and the city’s Economic Development Corporation had previously stated that project didn’t seem like a sound investment for city funds. 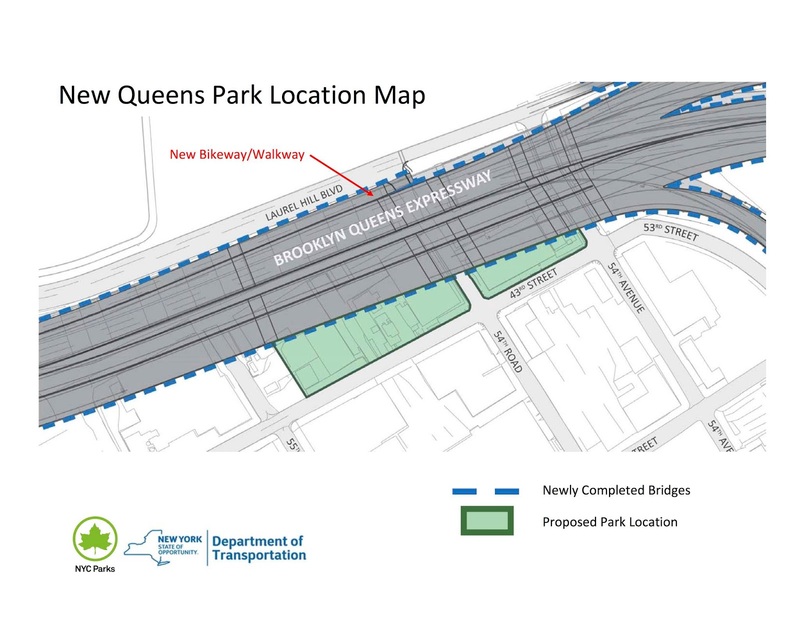 The New York State Department of Transportation’s (NYSDOT) Kosciuszko Bridge Project includes open space opportunities, including development of a new public park in Queens. The location of the new park, which was selected in conjunction with the New York City Department of Parks and Recreation and approved by Queens Community Board #2, is approximately bounded by 43rd Street, 55th Avenue, 54th Avenue and the Brooklyn-Queens Expressway (see map below). Design of the new park will begin this year, and it’s anticipated it will be completed between 2020 and 2021. 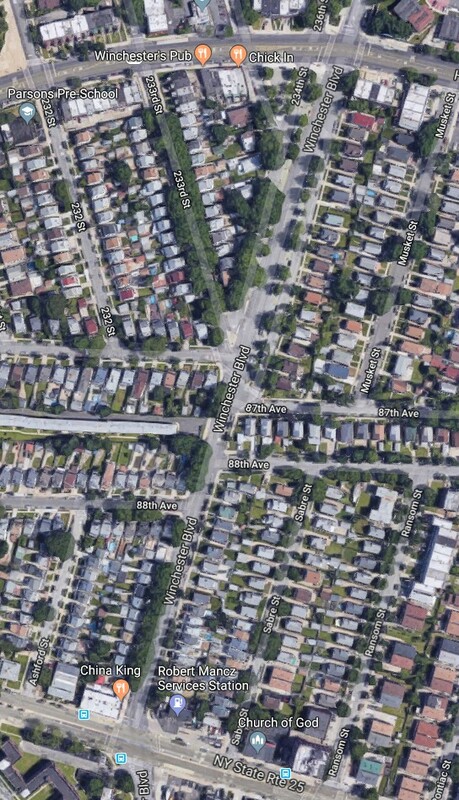 The new Brooklyn-bound bridge currently under construction will include a bikeway/walkway that will touch down on Laurel Hill Boulevard at 54th Road, a short distance from the new park. The Queens park consists of two (2) parcels, located north and south of 54th Road. The smaller parcel (approximately 8,000 square feet) and the larger parcel (approximately 24,000 square feet) will provide opportunities for a variety of active and passive features. The new park will include a comfort station. To identify those features that would be most suitable for the area, we would like the input of the local community and other potential users of this destination park. This was not a forum on issues within public housing, of which there are many, but instead an attempt to focus specifically on private homeowners and tenants. The frustration circulating through the room came to a boil when it came to deed theft – and the army of sketchy real estate investors residents say prey on struggling homeowners. 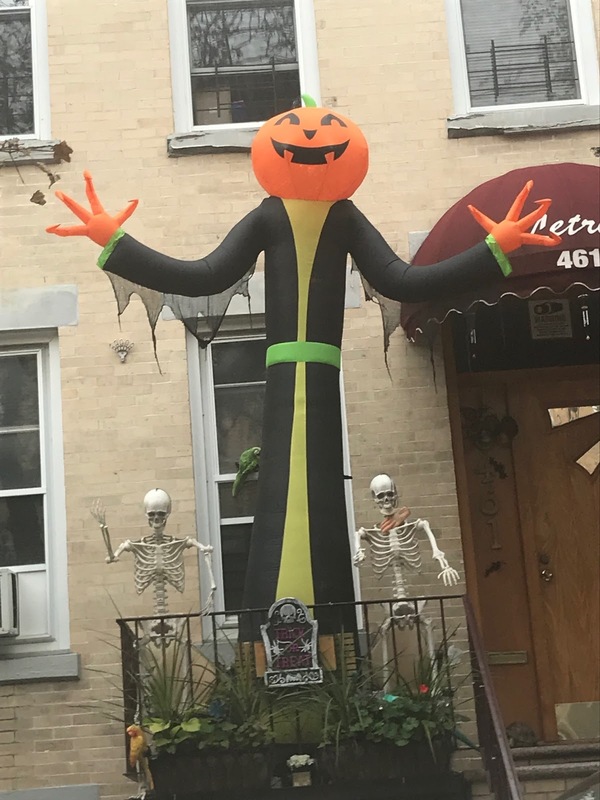 “Some of us have identified a single player who is a responsible for a disproportionate amount of skullduggery in Bedford Stuyvesant,” said Brooklyn resident Joe Gonzalez. “The third party transfer program, broadly speaking, is really mean to protect tenants of these buildings that have been severely distressed,” said Deputy Director of NYC Neighborhood Strategies Leila Bozorg. Inevitably, the conversation turned to the topic of gentrification, who’s responsible for it – and what can be done to neutralize the impact on private homeowners and tenants, who can no longer afford to live in their own neighborhoods. Photo is of CB11 meeting last night regarding the plan to upzone the corner of Northern Blvd and Douglaston Pkwy. CB11 voted unanimously to reject the proposal. The applicant's attorney fled the room before he was scheduled to speak. 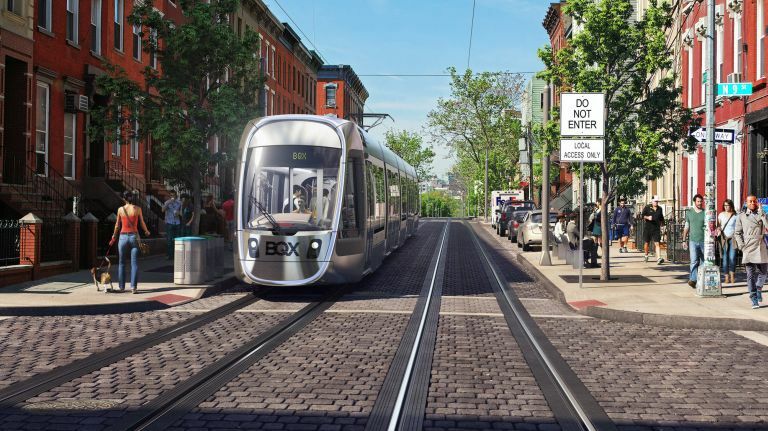 As the de Blasio administration looks to move forward with the proposed Brooklyn-Queens Connector, called BQX, there’s renewed hesitation among local elected officials, experts and some residents about the merits and prudence of the project. 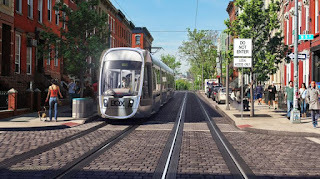 The latest skepticism comes after a summer report in which the administration outlined that the streetcar, now envisioned to run along the waterfront of Brooklyn and Queens from Red Hook to Astoria along an 11-mile route, would cost more and take longer than estimated to build while running a shorter route. "We would be able to add additional bus service — bus lines, express bus, Select Bus — we’d be able to do that extremely quickly, much more efficiently and at much lower cost,” said City Councilman Jimmy Van Bramer, whose district includes Long Island City, Queens, which the streetcar would transverse. A couple of years ago the city in their infinite wisdom decided to place Swales all over the Maspeth area. Few worked out okay most did not. To see the ones that did not take a drive down 63rd Street between 59th Avenue and 59th Drive, right behind Reiff Park. You will be astounded, shocked, dismayed, appalled, sickened horrified and repulsed by how the city has maintained these, ahem, wonderful Swales. Was the Nassau Coliseum deal a play-to-pay transaction? One of Gov. 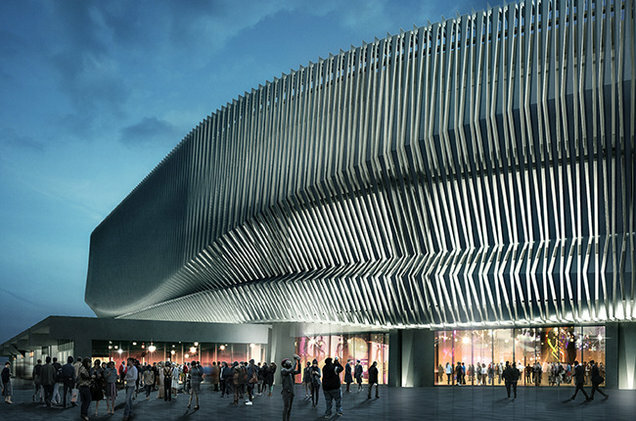 Cuomo’s biggest donors has landed a $1 billion-plus contract to develop the land surrounding Nassau Coliseum — infuriating other bidders whose proposals were solicited, then discarded, by government officials. “It’s pure pay-to-play,” said one of the developers frozen out of the mega deal who told The Post he wants a federal investigation. The developer, along with 16 others, submitted proposals this summer at the behest of Nassau County, which was looking to finally transform the sprawling property around the newly renovated stadium, which is now mostly a parking lot. But the county didn’t follow through with the proposals — making an unexpected announcement in early September that it would instead award the “Nassau Hub” project to a joint venture that included Scott Rechler’s company, RXR Realty Investments. The plan includes two hotels, 500 housing units and office and biotech research facilities, along with 200,000 square feet of retail space. Rechler is a Cuomo-appointed member of the MTA board, and a former Cuomo pick on the Port Authority board, who — along with his family members and corporations — has donated at least $548,982 to the governor’s campaigns since 2009. 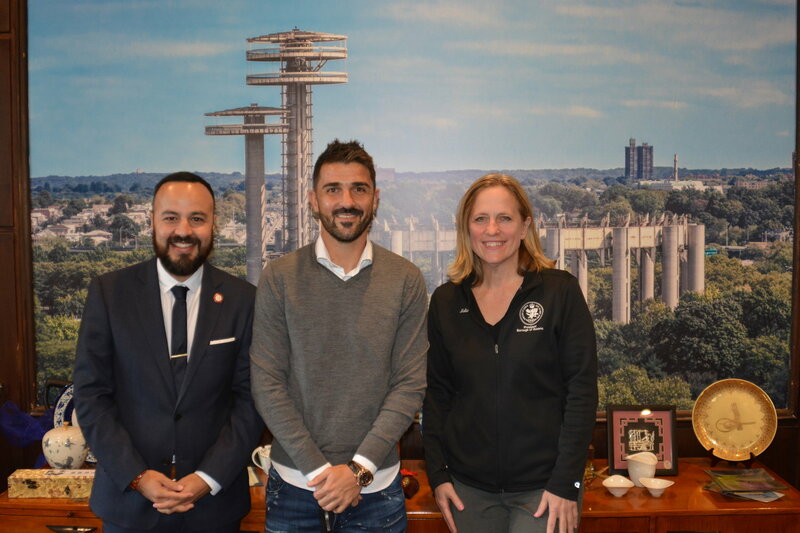 He is also a big donor to Nassau County Executive Laura Curran, and was a member of her transition team before she took office in January 2018. Rechler, his family and company have given $50,000 to Curran’s campaign. 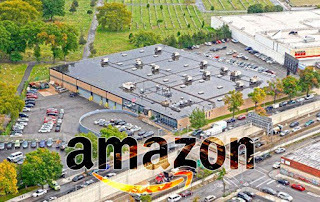 Amazon is opening its first fulfillment center in Queens at the site of the former Bulova watch company headquarters in Woodside, sources told The Real Deal. The e-commerce giant signed a lease for 83,000 square feet with San Francisco-based Terreno Realty Corporation, which bought the three-acre campus near the intersection of Queens’ major highways in March for $25.17 million, according to sources familiar with the deal. Representatives for Terreno and Amazon could not be immediately reached for comment. 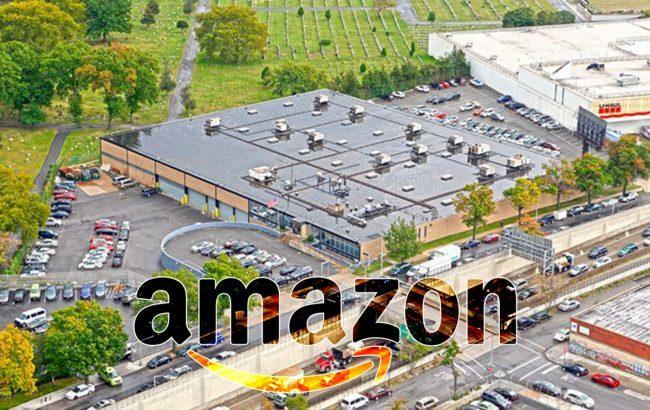 The new fulfillment and distribution center marks a further expansion into the five boroughs for the e-tailer and provides a boost of confidence for investors betting that demand from e-commerce companies will boost industrial property values. As the city phases out a controversial program that placed homeless people in often subpar private housing, a crucial question found its way to state Supreme Court in Brooklyn: Once the de Blasio administration stops paying rent for an apartment, are its residents entitled to lease it themselves? Wednesday a state judge said no. The jurist found that participants in the cluster-site program were not tenants in the apartments they occupied and thus have no right to a rent-regulated lease. Unless the decision is overturned by a higher court, the ruling is likely to discourage future lawsuits by homeless people and to bolster the position of landlords, who did not want to be forced into an agreement with tenants who might have trouble paying rent. Voice your positions using the contact information and link listed at the end of this newsletter. Deadline for public comments is October 29th, an email link and pdf form are attached below – please act now. This is urgent. Here’s what you need to know . . .
On August 15, 2018 Mayor Bill de Blasio’s office announced a plan to close the Rikers Island jail, replacing it with four gargantuan "jail" micro-cities in Queens, Brooklyn, Manhattan, the Bronx, each borough except for Staten Island. The proposed Queens jail would be constructed adjacent to Borough Hall, at the junction of Kew Gardens, Forest Hills and Briarwood. We must not allow this to happen – join us! Public comments on the Mayor’s Borough Based Based Jail System proposal are due to the City by October 29th, 2018. Only emails or mailed comments will be considered. to contact Mr Fiedler. A compose-email window to his office, will automatically open for you to easily compose and send your message. If you haven’t already signed our online petition please click here. To join our email list for updates and future actions, click here. Retired Suffolk County Police detective John Oliva specialized in gangs. So why are gang members recruiting children as young as 10 or 11? Feride Castillo of the Empowerment Collaborative of Long Island works with young children in poverty. Some females but mostly males make up Long Island’s estimated 1,000 gang members. Protection from bullying, a desperate need to belong and a yearning for respect are all reasons why Sergio Argueta joined at age 13 and led a gang for five years in Hempstead. “A mode of survival is fight or flight, right? And oftentimes, kids are getting tired of being bullied, of getting picked on,” Argueta said. A state appeals panel has yanked the permit to build an Upper West Side nursing home, a controversial project with the mayor’s support. 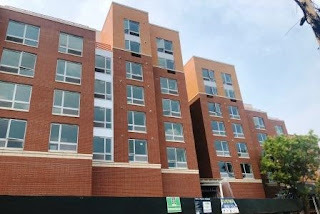 Neighbors of the 20-story Jewish Home Lifecare project at 125 W. 97th St. had sued to block construction, arguing the area is already too densely populated. In 2016, the mayor’s ­Office of Sustainability greenlit the project, even though a state environmental review had expressed concern about noise and hazardous material related to planned construction. But on Tuesday the Appellate Division put the kibosh on the plan, saying it violated zoning regulations about open space. Teens were transferred out of the Rikers Island jail complex to the Horizon Juvenile Facility in the Bronx, but the mom of one teen now at Horizon believes her son was better off at Rikers. The mother spoke with PIX11 on the condition of anonymity, she doesn't want anyone inside Horizon to retaliate against her 17-year-old son. His teen years have been spent in and out of courts and jail. She believes on Rikers Island he had access to more libraries and programs. The mom also said visits have been difficult at Horizon after several miscommunications. "Nobody wants their child to be locked away, but what you want most of all, is that if they are, that they are being treated as a person," she said. She isn't the only worried parent. Jimmey DeMoss, a single father from Queens, also has a 17-year-old son at Horizon. “He’s in there to learn a lesson, but the lesson I think he's learning is the wrong lesson,” DeMoss told PIX11 News. About 1,400 bus shelters across the city have been shut down for safety inspections after one collapsed earlier this month in Staten Island. JCDecaux, which operates all of the city’s 3,500 bus shelters, discovered bolts in the Staten Island shelter that appeared to be corroded, according to company spokesperson George Arzt. No one was injured when the glass and metal shelter collapsed on Oct. 5, Arzt said. About 3 percent of the first 1,000 shelters inspected revealed corrosion in bolts. He said those have been repaired and reopened. Back in 2005, the city selected Cemusa to build and maintain street furniture including bus shelters and newsstands. JCDecaux acquired Cemusa several years ago. The company is initially focusing on the first generation of shelters, but all 3,500 will be reviewed. New York City’s hotel-building boom has led to an oversupply of rooms — and enticing deals for aggressive acquirers who believe prices have finally hit a bottom. In 2007, there were a mere 73,692 hotel rooms and just 357 hotels. 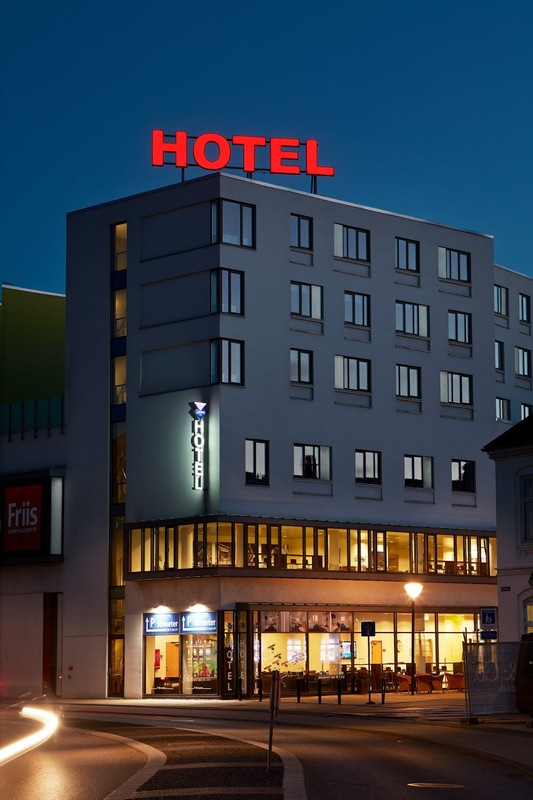 By 2017, that number had jumped to 115,532 rooms and 632 hotels, according to NYC & Co. Another 18,960 rooms will join the already oversaturated market by 2020. It seems we're going to have a major hotel-to-shelter conversion happening come 2020 when the city decides to bailout this industry. How many of these projects got zoning changes and variances for something the city doesn't need? 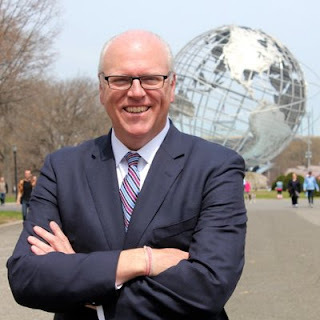 Veteran Rep. Joseph Crowley, defeated by newcomer Alexandria Ocasio-Cortez in a primary election that shocked the political world, is laying the groundwork for a comeback. Crowley has formed a state campaign committee “Joe for NY,” and is holding a fundraiser Oct. 29 at the Fitzpatrick Grand Central Hotel in Manhattan, where the maximum suggested donation is $10,000. No one is saying for certain, but it appears that the on-again, off-again proposal to build a men’s homeless shelter at a vacant factory building on Cooper Avenue in Glendale is on hold, according to Councilman Bob Holden (D-Middle Village), who addressed a packed house at the Juniper Park Civic Association’s meeting on Sept. 20. 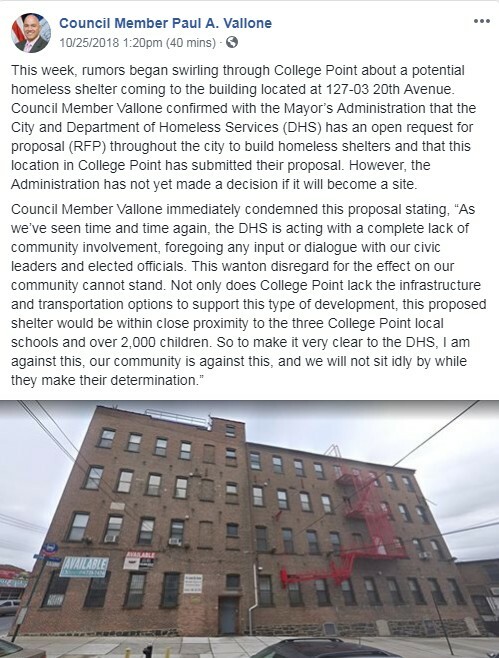 Holden said he received confirmation in July that negotiations were underway for a plan to erect a shelter at 78-16 Cooper Ave. The facility could house up to 200 beds, he said, the maximum number permitted by the city’s Department of Homeless Services. At the time, according to Holden, DHS Commissioner Steven Banks told him that no contracts had been signed. As things stand, Holden said Banks is open to discussing other possible locations for the shelter, leaving the Cooper Avenue site available for other purposes. A school, he said, “seems more likely now, it’s safe to say, than a homeless shelter.” The comment elicited widespread applause from the crowd. 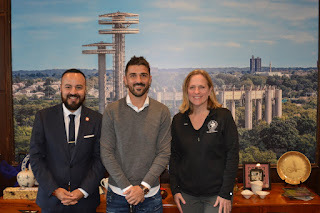 Assemblywoman Catherine Nolan said that rumors about a new homeless shelter in Maspeth has been confirmed to her office from an unknown source. Nolan told QNS on Friday afternoon that the shelter could be placed at P.S. 9 on 57th Street — but other activists and politicians are holding their tongues. The assemblywoman also declined to disclose the identity of the source. Although city officials have yet to confirm this, Nolan worries the de Blasio administration could act fast to divert students – many of whom are bused in – and place “hundreds” of homeless people in the building. “When the city moves, it moves very quickly, and I don’t want to wake up next week and find beds in P. 9,” Nolan continued. 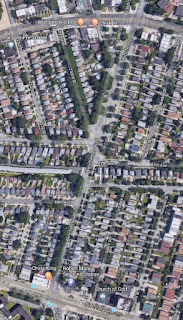 Nolan also spoke of concern about a potential shelter at Summerfield Street and Wyckoff Avenue in Ridgewood. Ozone Park activist Sam Esposito made a Facebook post on Sunday evening in which he claimed a tentative victory in the Ozone Park Block Association’s crusade against the homeless shelter being constructed at the former Christ Evangelical Lutheran Church on 101st Avenue and 86th street. The shelter is being constructed to house 113 men with mental illness. Esposito claimed that major work had stopped and that a change in plans by the city will be made public soon. Isaac McGinn of the Department of Homeless Services, however, said the city is going ahead with its plans to turn the church into a homeless shelter. Could you please write something on the proposed Belmont Arena project. 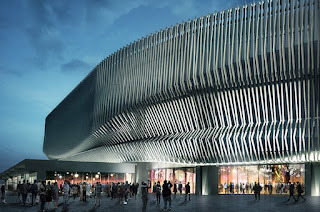 This very large project is in Nassau County within walking distance to Queens will affect every surrounding community within miles of the arena. What they don’t tell you in this article is in addition to the 19,000 seat arena there is a 250 room hotel, a very large Retail Village (Mega mall) and NYRA is planning on making major renovations and changes to the race track. The project is to large, will create gridlock for miles, turn our residential streets into parking lots and devastate all the surrounding communities. I am not a Islander fan but this project has very little to do with bringing the team back to Long Island. The Islanders will only use the arena 40-50 days a year. Between other events at the arena, racing at Belmont, seven days a week shopping at the mall we can expect easily an additional 30,000-40,000 people a day. Belmont Stakes day every day. Our communities are not against development at Belmont we are just asking for smart development. 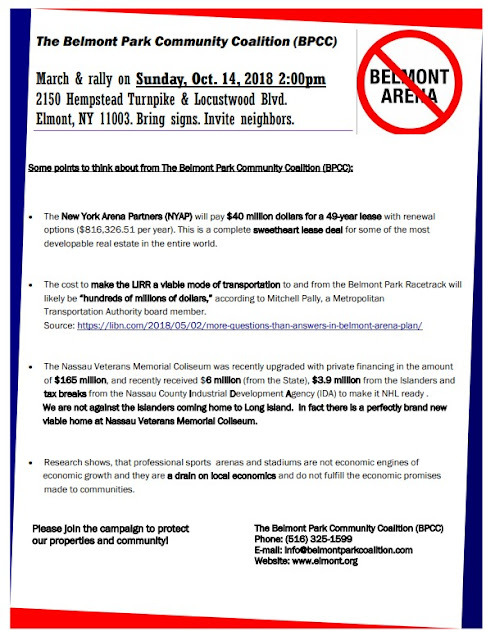 There is a rally against the proposed arena on Sunday October 14th at 2:00PM on Hempstead Turnpike in front of the proposed site. 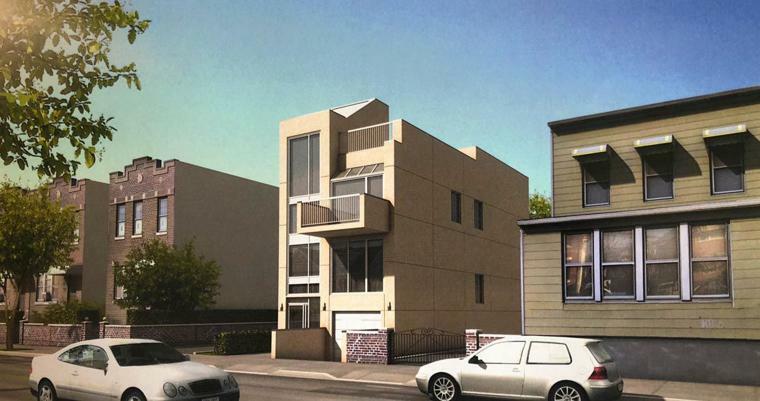 David Kronman of Astoria West LLC is working on a new Astoria project. The building will be addressed at 11-37 31st Avenue and it will be 91-feet tall and it will span over 110,000 square feet once completed. The designer for the project is Christopher Fogarty of Fogarty Finger Architecture. The development is a ground-up project set to replace an existing two-story building. There will be 168 residential units on site. The 30% rule, the federal standard for being rent-burdened, is an imperfect measurement. High earners could spend a third of their income on rent and still have money left over for luxuries; but some low-income residents, who make up the lion's share of the rent-burdened, can be hard-pressed to pay for necessities if 30% of their earnings go toward rent. As the report notes, many of the poorest residents spend an even higher percentage of income on housing. About 22% of city households, predominantly made up of low-income senior citizens and single parents, were found to be severely rent-burdened, meaning they devote more than half of every paycheck to rent. Recording from their living room window, the Wlodys say they’re fed up with their neighbors. Right next door, sharing a wall with the Wlody’s in Howard Beach, is a group home for developmentally disabled adults, run by Birch Family Services. Since 2013, the Wlodys say their home, once a sanctuary, turned to hell. They say thousands of photos and videos they’ve recorded themselves illustrate what occurs almost daily. “It’s upsetting. It’s also traumatizing. The thuds, the crashes and the screaming that carries on for the longest time,” said Corinne Wlody. The Wlodys say they have witnessed staff at the group home use abusive language and exhibit near violent behavior. They say they’re concerned for the vulnerable residents and want the public and the families of the residents to know what is really happening behind closed doors. Safety changes are on the way for a street that has been dubbed the new boulevard of death -- the Northern Boulevard in Queens. More than 1,700 kiosks across the city offer free Wi-Fi calls and USB ports to charge devices. But it turns out those ports are causing concern for some New Yorkers, who say the kiosks have become hangouts for the homeless, CBS2’s Reena Roy reported Wednesday. In a disturbing video posted on Facebook, a pack of dogs are seen running scared in a yard in Far Rockaway, Queens. Their owner appears to verbally and physically abuse them on-camera, in broad daylight. It’s a scene too disturbing to show on television, but residents tell PIX11 it’s just another day at the Thursby Avenue home. “He started beating all the dogs, I saw that the dogs were very skinny and bleeding,” Tamara Demkoff, a local animal advocate, described to PIX11. Demkoff shot the disturbing video on her cell phone back in February. According to her, she’s one of many from the community who has pleaded with the dogs’ owner, identified as Terrance Alexis, to surrender the animals after receiving numerous complaints from neighbors. “Everybody knows about this guy, but no one does anything about it because everybody is afraid of him,” she said. Months after that video was taken, it appears the problems on the property have gotten worse. Nathylin Flowers Adesegun says she organized the Friday protest with Vocal NYC, a homelessness advocacy group because she said they are fed up. At 72 years old, Adesegun is herself homeless, living in a women’s shelter in Queens after being evicted from her rent stabilized apartment back in February 2015. Adesegun said the group wants 24,000 units from new construction in our city to be used for homeless and low income people and cornering the mayor at the gym was the only way to get his attention. The video then shows De Blasio’s security officers stepping in front of the woman as the Democratic mayor gets up and walks away, cell phone in hand. Adesegun says it worked. She says the group received a call from city hall and was told a meeting would be arranged with the mayor. However, when PIX11 called a city hall spokesperson to confirm those details, we were told VOCAL NYC will meet with city hall officials and not necessarily the mayor. Adesegun said they’re not interested in being strung along any further. On October 24th the group plans to protest in front of Gracie Mansion. If you’re looking for a taxi ride in New York City, you may have to look elsewhere. There are a whole lot of taxis, but none of them parked at the block-long abandoned gas station have license plates or even medallions. It’s become a makeshift taxi graveyard, and frustrated people who live and work in the area have been unable to get the city to do anything. 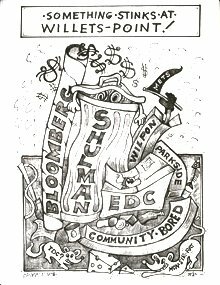 In his heyday, Friedman was a major donor to Mayor de Blasio who raised more than $70,000 for hizzoner. He partnered with President Trump’s personal lawyer, Michael Cohen, who city officials believe may now own some of the abandoned vehicles. 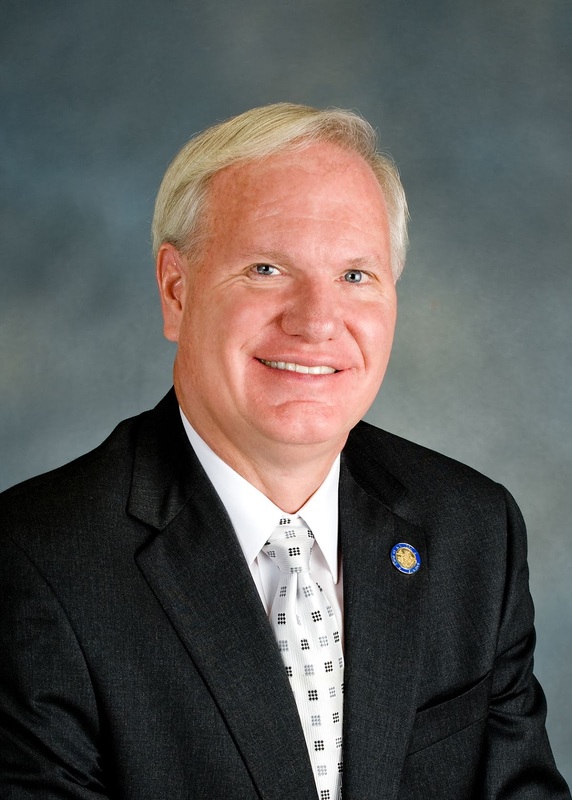 State Sen. Tony Avella, a former member of a now-defunct group of breakaway Democrats who lost to John Liu in his district’s Democratic primary in September, announced Monday that he will still run for his seat in the general election. The Queens senator said in a video that he will run as a candidate for the Independence Party and the Women’s Equality Party. Mr. Liu, a former New York City comptroller, beat Mr. Avella in the primary after announcing his own last-minute run. However, Mr. Avella said that he will have strong support in the general election from voters who couldn’t vote in the primary. “Although I was disappointed in the results of the Democratic primary, I have been astounded by the level of support I have received since then from all aspects of our community,” he said. Like Mr. Liu — who made a last-minute push to get on the Democratic ballot this summer after encouragement from a grass-roots group — Mr. Avella said residents urged him to continue his campaign. Longtime state Sen. Frank Padavan died, according to an announcement from the Queens County GOP Tuesday morning. Padavan died of a heart attack at New York Presbyterian Hospital, according to a source. 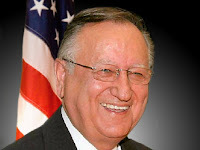 A Republican, Padavan went to Albany in 1972 as the state Senator from the 11th District, a seat he would hold for 38 years representing a wide swath of Queens, including Bayside, Bay Terrace, Queens Village, Bellerose, Flushing, Whitestone, Little Neck, College Point and Jamaica Estates. Padavan fought hard for mental health patient rights, education, and fairness in the criminal justice system before losing to state Sen. Tony Avella (D-Bayside) in the November 2010 general election. A company representative forwarded the Chronicle a statement from owner/operator Jack Bert, who thanked the community for its patronage over the years, as well as his employees, “all of whom have been offered the opportunity to work in our other restaurants,” a number believed to be between 20 and 25. Most if not all have accepted the jobs, a McDonald’s spokeswoman said. The company would not give a reason for the abrupt shutdown, though Assemblyman Ron Kim (D-Flushing) and John Choe, the executive director of the Flushing Chamber of Commerce, offered their takes. Kim said in the big picture that new restaurants and eateries — many of them well-financed by conglomerates — are springing up in Flushing all the time with access to marketing money, technology and social media expertise. But he also said this particular McDonald’s had a strained relationship with the neighborhood’s Korean community going back more than five years when the owner attempted to keep elderly Korean residents from taking up tables for hours at a time to socialize while he was trying to keep customers flowing. 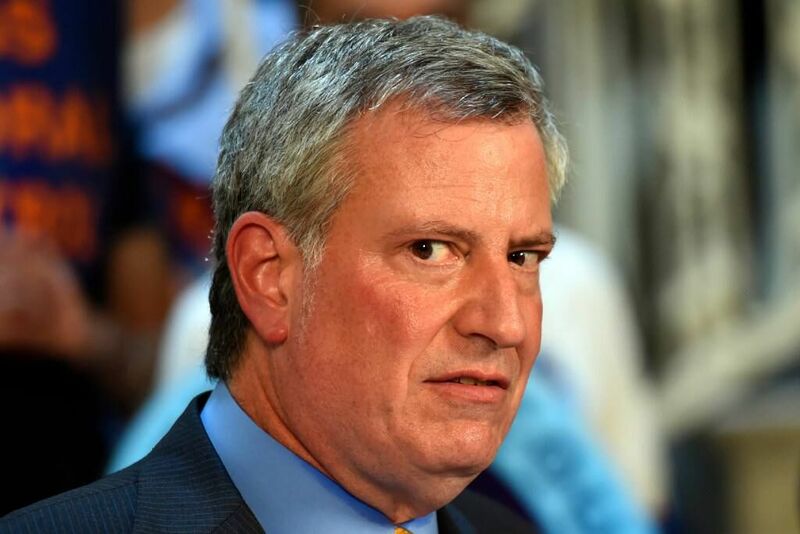 Mayor Bill de Blasio today defended the city’s taking of more than 60 properties in Brooklyn – including those of at least three fully paid off African American owned properties worth millions of dollars – and transferring their ownership for “re-development” to non-profit and for profit companies. But New York State Attorney General Candidate Keith Wofford took de Blasio and the entire city government to task for incompetence at best, and illegal political corruption at worst, in seizing the properties. “What’s happening here is disgraceful and likely illegal. Mayor De Blasio lives nearby and sleeps securely at night, while his administration creates anxiety and fear among vulnerable citizens whose largest asset is ripped away without compensation or due process,” said Wofford. Wofford went so far as to call the foreclosure proceedings “unconstitutional,” and urged the Mayor to act immediately in stopping anymore transfers under the program. The program that the city’s Department of Housing Preservation & Development (HPD) utilizes in taking properties is called the Third Party Transfer (TPT) program, which goes back to the 1980s when New York City had many blighted and burned out properties. The program designates qualified sponsors to purchase and rehabilitate distressed vacant and occupied multi-family properties in order to improve and preserve affordable housing for low-to moderate-income households. Over the years the program has been amended in its definition of distressed properties, most recently in 2016, in which the City Council approved an expansion of the program to include buildings which are subject to Environmental Control Board (ECB) judgments as a result of building code violations in the amount of a lien to value ratio equal to or greater than 25%. In order for HPD to obtain the foreclosure judgments, the agency sought, needed and received city council approval – an approval that some city council members now say they approved because HPD misled them. The story came to light, when KCP learned the city foreclosed on Marlene Saunders, 74, a retired nurse, who nearly lost her paid-off and in pristine condition brownstone at 1217 Dean Street on a rapidly gentrifying block in Crown Heights. The three-story brownstone had been in the Saunders family for 30 years and has been appraised at over $2.2 million. Saunders son showed KCP copies of checks paid and cashed by the city for property and water taxes, but were never applied to the property. He also stated the family knew nothing about the court proceeding, in which a foreclosure judgement was issued and only learned the family no longer owned the property through a flyer delivered to the brownstone months after they lost the deed. The state is designating the Columbus monument at Columbus Circle as a landmark — in case the city tries to move it in the future. The New York State Board of Historic Preservation voted unanimously on Sept. 20 to place the statue in the state and national registers for its historic and cultural significance. The action was not publicized. Gov. Cuomo is expected to announce the designation at the Columbus Citizens Foundation dinner Saturday night and the news will be celebrated at the monument on Sunday — ahead of Monday’s Columbus Day Parade. The 76-foot beaux arts monument was designed by Italian sculptor Gaetano Russo and it’s his only sculptural art work in America. The father of two toddlers who were found seriously hurt in their Queens home last week — one of whom later died — jumped to his death from a Midtown hotel, police sources said. Mohammad Reza Torabi, the father of the 1-year-old twins, was found dead Saturday after jumping from the Renaissance New York Hotel 57 on East 57th Street, according to police sources. Police had been interested in questioning Torabi about the incident prior to his death, the sources said. 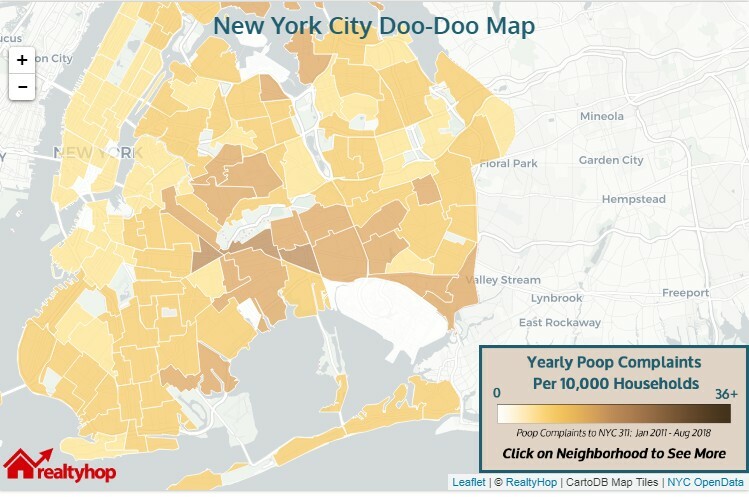 ...a report from RealtyHop, which looked at 311 poop complaint data for New York City and other cities. With over 84,000 registered dogs in the city (which the city's Department of Health estimates is just 20 percent of the total dog population), there were 2,458 poop complaints logged in 2017, a decrease from the prior year. State Sen. Michael Gianaris (D-Astoria) and several Long Island City community organizations are urging the city to include park space in Court Square as the neighborhood continues to grow at an unprecedented pace. 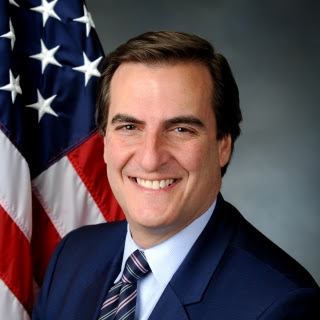 Gianaris called on the city Department of Housing Preservation and Development and the Department of Transportation to renovate public land located underneath the Queensboro Bridge ramps between 23rd Street and Thompson Avenue and turn it into public space to reflect a proposal made in the 1999 Department of City Planning study. The public-owned lots are currently used by the city Department of Transportation and while the city can not build on them, it has proposed transferring air rights to The Lions Group, which plans on building two residential towers at 27-01 and 26-31 Jackson Ave. The Court Square Civic Association organized a rally against that plan last Saturday at the corner of Dutch Kills Street and Jackson Avenue.